The story of Jeffs Flaming Ruby Emerald X30! “I first came aware of Emerald guitars several years ago while looking into travel guitars. The Emerald X5 was really tempting. But, life happens and I never did pull the trigger on one. For the past year, I’ve been trying to decide what guitars I want to go into my retirement years with. To thin my heard down to just 2 guitars, I figured a Martin D35 for playing inside the house and a Carbon Fibre to play anytime and anywhere outside the house. So I read every thread and watched every on-line video of Emerald guitars repeatedly that I could find. 6 month’s ago the internet was buzzing about amber Cocobolo units. But, I wanted something different and made up my mind early to get a red ‘Emerald Ruby’. When Alistair posted the unboxing Ziricote #102 video with the distinctive Gothic Cross, I instantly knew that would be the perfect veneer for an ‘Emerald Ruby Cross’ project. I felt extremely lucky it was still available when I contacted them about it, and didn’t hesitate to reserve it. As the discussions progressed, Alistair’s excitement kept building as my vision of the Emerald Ruby Cross unfolded. They were very easy to work with and went way out of their way to make sure everything was right. There were many proof pics of templates in various positions on the raw veneer to find the perfect setup. They were unsure just how well the heartwood would take a wash of transparent red, so they took a scrap piece of Ziricote and experimented with the transparent red, which turned out great. Sonically we decided on going with the new X30 platform and kicking it up with multi-scale-length fanned frets. The longer mid & bass scale lengths should result in increasing string tensions and projections. The goal was to have maximum bass and shimmering highs without loosing the mids. The way Alistair has the fee structure set up is really nice. Half down on custom orders with the balance due after it’s built before it ships out. As far as the money goes IMHO these custom woodies are in the same ball park as a nice D28 or D35, but when you split that into 2 payments it makes it very do-able. Now that I have the Emerald Ruby Cross at home the money, the wait and anticipation were definitely all worth it. Aesthetically, in normal room lighting the colors are subdued compared to the glamor shots with bright lights. However, the Ruby cross pretty much always shines like it has some kind of internal paranormal light that draws you into exploring more features. Everyone that sees it is awe-struck. 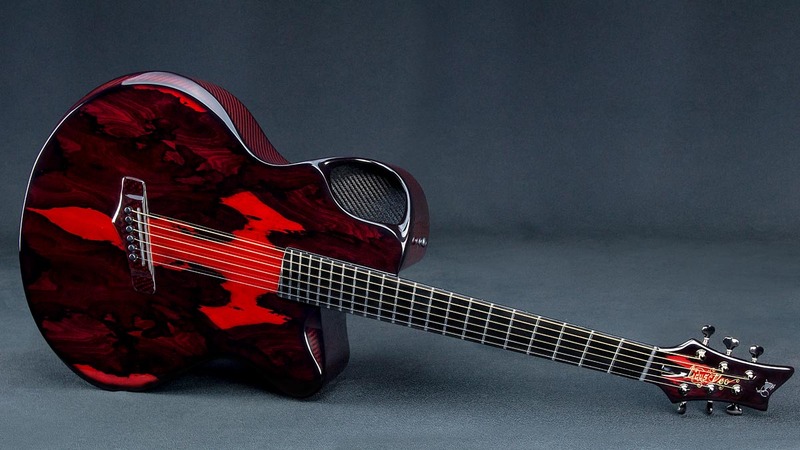 Sonically, it greatly exceeds what I thought was possible with a carbon fibre guitar. No other CF brands even come close to this X30 with fan frets. In fact, this has such a lush sound that it is satisfying my itch for a D35. There’s nothing that a D35 can do that my custom X30 can’t. And since Jeff sent these words he has indeed ordered another very special custom that Im sure will be worthy of a future blog.